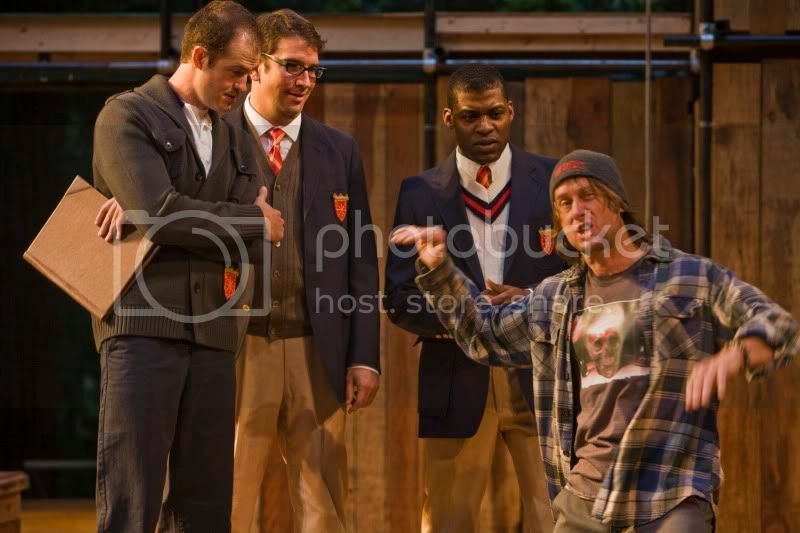 Costard (J. Todd Adams) describes his newfound "lady friend" to Berowne (Adam O'Byrne), Longaville (Brett Duggan) and Dumaine (Richard Prioleau) in the Shakespeare Santa Cruz production of "Love's Labor's Lost". As with every Shakespeare Santa Cruz production, this production has chosen to use contemporary costumes in order to make the show more accessible, or perhaps, to reflect the timelessness of the themes. I like the comedies- who doesn't? While this particular production is a bit over-the-top, I think it works. I hadn't read this play before, so other than knowing that it was categorized as a comedy, I went in cold. I was pleased to see some familiar faces from last year (J. Todd Adams, who played Puck in A Midsummer Night's Dream), along with some outstanding new talent. The standout performer in this production was Dana Green, who played Rosaline; she is simultaneously dark and fair, has a voice like a 1920's jazz singer, and has a presence on stage that borders on distracting- in the best way. Green plays the sharp-tongued Rosaline with her tongue firmly in her cheek and a playful air. The other standout was V Craig Heidenreich, who played King Ferdinand with a command of the stage that reminded me of Martin Sheen on the West Wing- with an air of authority and a booming voice that fills the Festival Glen, which is no easy feat. Overall, I wouldn't say that this was my favorite play, but isn't a reflection on the production; just my tastes. If you like Shakespeare's comedies, you'll enjoy "Love's Labor's Lost". It's worth mentioning that Shakespeare Santa Cruz is doing something differently- but I'm not sure what. There were more chairs *and* there was more "groundling" seating, and every seat was full. Not only was this a standing room only show, but the audience was well matched to the performance; lively and responsive. I've said it before, but it's worth saying again. Even if you have no interest in Shakespeare, give Shakespeare Santa Cruz a try. The outdoor Festival Glen makes a great spot for evening romance and so does the brisk Santa Cruz air.